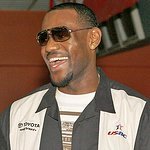 On Thursday, the University of Akron and LeBron James jointly announced an exciting partnership between UA and the LeBron James Family Foundation. Speaking to more than 6,000 students and parents in the Foundation’s “I PROMISE” Network at Cedar Point, UA President Scott Scarborough talked briefly about his grandfather, who moved his family to a college town and worked extra hours so he could enroll and eventually graduate. “My grandfather unlocked the door to the America Dream, then held it open for others in our family. He paid for us to go to college. “I got to where I am today because I stand on the shoulders of that good man. “LeBron James is offering all of you the same opportunity… and he has pretty big shoulders – if you’ve ever stood next to him you know what I mean. “We are proud that we have formalized our long partnership with his Foundation and that we have extended scholarship opportunities to all of you, his kids. “That means that if you work hard and stay on track, your college education will be financially covered. For all of you AND the next four classes that enter the program. “But that is just one facet of our partnership. “Already, our professors are working with the Foundation to identify the best measures of success for students in the Wheels for Education program and the Akron I PROMISE Network and to find ways to help them even more. “In addition, our faculty will recruit and train our students to become mentors for LeBron’s kids. “Finally, I am pleased to announce that we are renaming our College of Education as the LeBron James Family Foundation College of Education. We do so to symbolize our commitment to his promise, his kids, the American Dream and our hometown of Akron.